Daniel Schurz, vice president of commercial operations for Frontier Airlines, says his airline's fares will be the lowest available for Rio Grande Valley travelers. Flights to and from Denver and Chicago to Valley International Airport will begin in November. HARLINGEN — Frontier Airlines is bringing its low-cost air fares to the Rio Grande Valley. Officials with Frontier and Valley International Airport announced yesterday that nonstop air passenger service between Harlingen and Denver and Harlingen and Chicago will begin in November. “I’ll tell you what, I can hardly express my excitement about this big announcement, I can hardly talk,” said Marv Esterly, director of aviation for Valley International. Flights from Harlingen to Chicago O’Hare Airport will be available on Wednesdays and Saturdays, departing Harlingen at 6:05 p.m. and departing Chicago at 1:54 p.m.
Flights to Denver will be available Tuesdays, Thursdays and Saturdays to Denver International Airport, departing Harlingen at 10:55 a.m. and departing Denver at 6:15 a.m.
All of Frontier’s passengers will fly the 180-seat Airbus 320. About 200 officials, airport and airline executives, business people and media from Harlingen, South Padre Island, Cameron County and Mexico were present for the announcement. A significant emphasis in yesterday’s announcement involved South Padre Island. Mayor Dennis Stahl said Island officials have been involved with Harlingen, county and airport officials in negotiations with Frontier for the previous eight months. The Frontier announcement is just the latest good news for Valley International. Just days ago airport officials announced the airport’s biggest project since 1990, a $15.5 million upgrade to replace 1930s-era concrete on taxiways and aircraft parking areas. In May the airport opened a state-of-the-art, $3.8 million aircraft fire and rescue facility. The airport is currently undergoing a $1.2 million project to rip out the original late 1980s ceramic tile in the terminal building and replacing it with blue and gray epoxy terrazzo. The airport also added new air chillers and fan coil units, a new HVAC system which has cut utility costs by 30 percent and new LED lighting. A new roof is coming next year. 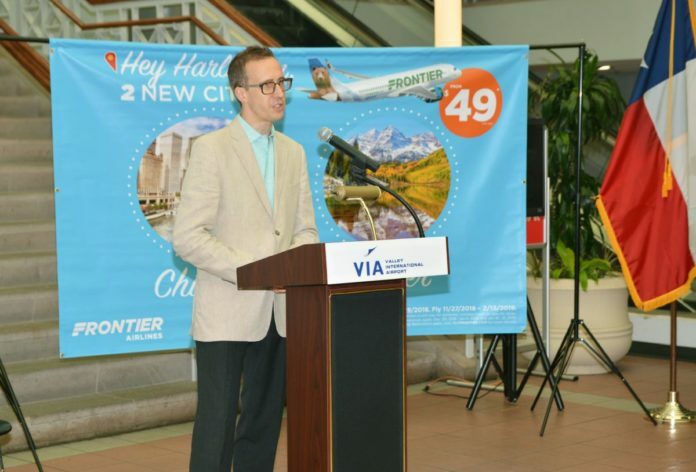 Frontier Airlines becomes the fifth air passenger service at Valley International, a group which includes Southwest Airlines, United Airlines, Sun Country Airlines and Delta Airlines. Valley International also is an air cargo hub for DHL, Fedex and Southwest Cargo.